Model 2650 Micropositioner is an electronically controlled hydraulic micro stepping positioner. 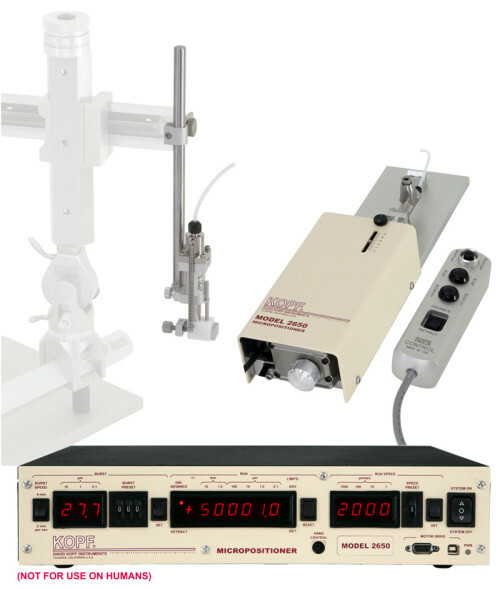 David Kopf Instruments offers a wide range of products for micropositioning that combine rapid motion with micro meter scale resolution. Electronic control assembly is designed for continuous motion speeds (run mode) that can be pre-selected up to 10 pre-defined speed settings with ranges from 1 µm/sec. to 4 mm/sec. Rapid single motion (burst mode) travel range: from 0.1 µm to 99.9 µm with resolution of 0.1 µm. The burst movement may be accomplished at either 2 mm/sec. or 4 mm/sec fixed speeds. Due to the performance characteristics of the hydraulic system, burst travel range setup of .5 µm or higher is recommended. Model 2650-Z Hand Control with 10 foot cable provides absolute control of the microdrive. Hand Control with 25 foot cable can be provided upon request. A retract /advance rocker switch is utilized for directional positioning. Burst and run movement are controlled with individual pushbuttons. A reset button (recessed guard protection) is used for resetting the control panel display readout. We also offer Model 2650-Z-T Hand Control with spring loaded toggle run switch as an alternative to the standard pushbutton style run switch. Standard unit is a bench top set-up. A 6 foot power cord with applicable power plug is included. All Kopf 2600 series Micropositioners are FCC, Part 15 and CE approved. Must be specified at time of order or standard accessories will be supplied. The hydraulic motor drive is designed to support linear movement with travel range up to 25 mm. Unit incorporates a limit switch at each end of travel and will automatically stop when reached. A 15 foot cable is used for connecting to the electronics control assembly. Master and slave cylinder have 1:1 ratio and are connected by 4½ ft. heavy walled flexible teflon tubing. Cylinders have rolling diaphragms to provide absolute separation of air and fluid. Distilled water is used because of its compression factor and low coefficient of expansion at room temperature. The slave cylinder is supplied with a standard acute electrode block. Chronic electrode block is available and can be supplied upon request. Slave cylinder holder is included for easy attachment to any Kopf manipulator. Master and slave cylinders are easily removable for performing refill procedure on hydraulics assembly.